BUYSOUNDTRAX Records proudly presents YOU MUST REMEMBER THIS TOO: CLASSIC FILM MUSIC ARRANGED FOR GUITAR. The album features music composed for motion pictures by Ernest Gold, Alfred Newman, Erich Wolfgang Korngold, Miklós Rózsa, Bernard Herrmann, Angela Morley and Dimitri Tiomkin, arranged for guitar by Gregg Nestor, performed by Gregg Nestor and William Kanengiser, augmented by Francisco Castillo on Oboe , Jessica Pierce on Flute, Kevan Torfeh on Cello, David McKelvy on Harmonica and Anna Bartos, Soprano. YOU MUST REMEMBER THIS TOO presents this film music in an entirely new light, adapting the pieces for two guitars, in arrangements based faithfully on the original scores by internationally acclaimed guitarist Gregg Nestor. YOU MUST REMEMBER THIS TOO contains selections from films such as IT’S A MAD, MAD, MAD, MAD WORLD, ALL ABOUT EVE, WUTHERING HEIGHTS, MADAME BOVARY, MOONFLEET, YOUNG BESS, PSYCHO, WATERSHIP DOWN, FRIENDLY PERSUASION and more. For this recording, Gregg was allowed access to the personal archives of the composers represented on this album. The results are arrangements as concise and accurate as possible to the composers’ original intentions. 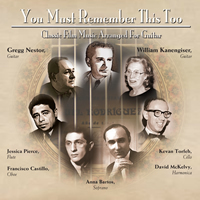 BUYSOUNDTRAX Records is proud to present YOU MUST REMEMBER THIS TOO: CLASSIC FILM MUSIC ARRANGED FOR GUITAR, featuring music composed by Ernest Gold, Alfred Newman, Erich Wolfgang Korngold, Miklós Rózsa, Bernard Herrmann, Angela Morley and Dimitri Tiomkin. The booklet contains liner notes written by Steven C. Smith, noted author of A HEART AT FIRE’S CENTER: THE LIFE AND MUSIC OF BERNARD HERRMANN.